The work chosen from arte-sur.org by Matheus Rocha Pitta, Circular (2011), did not lend itself to a presentation at the Palais de Tokyo due to its site-specific context in Rio de Janeiro. In the place of Circular, Rocha Pitta proposed and realised the production of a new work, Fist Agreement (2013). Initiated by the remembrance of a quote from the artist Thomas Hirschorn, “To change reality you must first accept it. 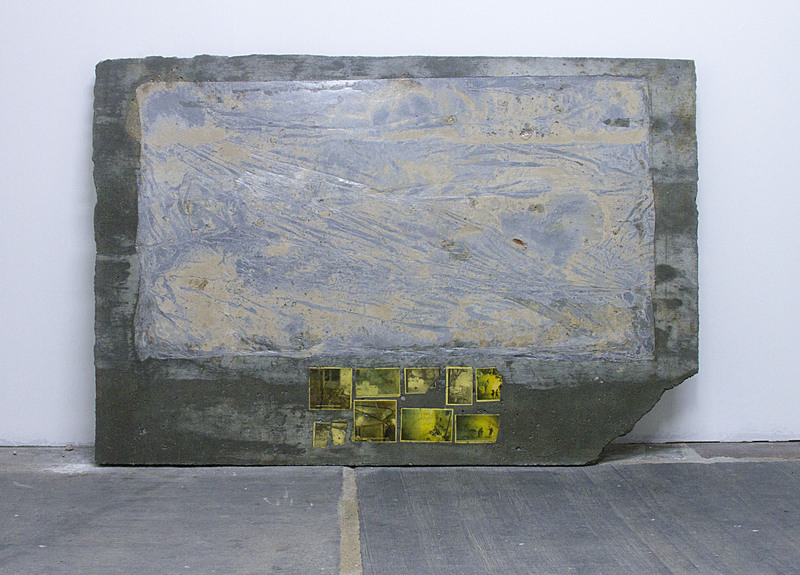 Agreeing with reality is the first step to changing it”, the artist Rocha Pitta associated this thinking with his research into funerary slabs from ancient Egyptian, Greek and Roman culture. In these artifacts, the dead are continually depicted, in painting or relief sculpture, shaking hands or embracing the divine. With his work First Agreement, Rocha Pitta leans two rectangular concrete slabs against the wall. 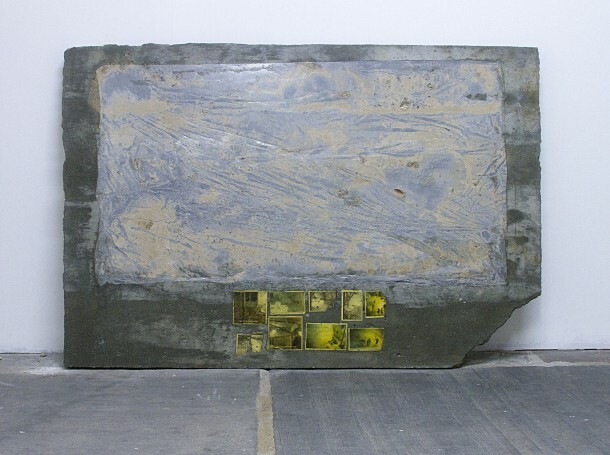 Embedded within the surface of the material are images clipped from the pages of newspapers and weekly magazines, showing a series of greetings and agreements between politicians and military figures. Mirroring the poses of the funerary slabs, the figures hold hands, hug and place kisses on each other. These scenes are real events, but also staged encounters for the press. These public displays of warmth, welcoming and indeed agreement are transmitted as signs to the public that partisan alignment and cooperation is at hand in their governmental and military processes. The echoing of the figures’ and forms in historical context is something that Rocha Pitta has been interested with throughout his practice of late. These nods to our ancient cultural symbols, mostly religious in this case, allow the artist to draw on the grand narratives and seemingly universal reasons for cultural communication. Depicted with contemporary materials, with a cheapness and at hand readiness, the works also lend themselves to the traditions of Arte Povera. Not only from a place of lineage in the art trajectory, but also through a deep knowledge of the history of monastic poverty associated with the following of Saint Francis. This economy of means is something shared by both the spiritually devout as well as artists through several generations of the 20th and 21st centuries. By linking these political and militaristic agreements in parallel to ancient crypts and tombs, other readings of the events come to the fore. In Western cultures at least, these actions are also usually associated with formal and legal agreements written down and inscribed into the laws and policies of the land. Treaties and contracts often become tombs of political and economic contexts themselves, causing many future problems due to the fact that they take much effort to re-negotiate. This inflexibility in our ways of working prioritizes the written words of the past over the conversations and situations of the present.